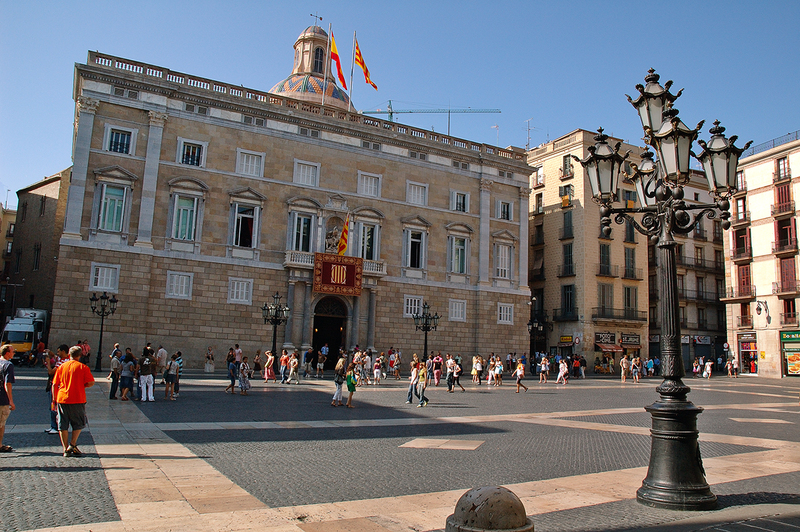 Sant Jaume square with Palau de la Generalitat in the background, a place many of you will remember if you've ever been to Barcelona. In case you haven't, you ought to know that Palau de la Generalitat is the headquarters of the Government of Catalonia and of the Presidency of the Generalitat. The building was originally designed by architect Marc Safont and erected under his supervision in XV c. over a previous property bought by the Council, further undergoing important structure transformation and blending of architectural periods. The façade and two important sections are of renaissance style but once the Courts took over the building in the XVIIIth century the chapel was extended and the bell tower was crowned according to the predominant Gothic style. In 1914 a major restoration was carried out to recover the palace to its original preservation state right before the occupation by the Courts. Those works were directed by Josep Puig i Cadafalch, the prolific modernist architect many times featured in this blog as for example in my post: La Diputació (Barcelona Provincial Government) not to be mistaken with La Generalitat!. Here's all you need to know about Catalonia's government structure. To finish I invite you to zoom in and locate today's image on the map at the bottom of the page. Amazing the square. Really beautiful and open space. Your yesterday photo, my friend, is quite unique. I'm sorry I couldn´t drop by yesterday. -Thanks Daniel obrigado. Es un placer contar siempre con tus visitas y amables comentarios. -Don't worry Quin, it is the good intentions that matters. I will check your nice place soon. Beautiful place, nicely maintained buildings and looks like nice weather. La foto debe ser de archivo -o tenemos unos turistas muy calurosos en enero. Gracias por la info. Es curioso aprender nuevas cosas de edificios con los que he vivido toda la vida, y más curioso aprenderlas leyéndolas en inglés. I recently came across your blog. Thank you for the beauty. It's been more than half a lifetime since I was in Barcelone--Franco's machine-gun armed security police manned each street corner at the time--but through your eyes & camera I can see the city's beauty remains . . . wonderful. Thank you. I love the feel of movement in this shot, with all the people walking about. Really nice.